It might be hard to believe, but even now in 2017, there are still lots of companies that rely on traditional paper-based filing systems. Let’s make one thing clear: “traditional” doesn’t necessarily always mean something “bad” and companies should not be expected to immediately adopt every new trend as soon as it comes out! Having said this, just like we often look into what “digitalisation” actually means for a company, in this blog we are going to look at the different benefits of Electronic Document Management. Digitalisation, just like the internet or mobile phones, is here to stay. Some companies might just be focusing on their current full order books and may not think that they need to make any changes, even though they urgently need to address the issue of modernising their filing system. In the UK, the British Standard (BIP 0008) which lays down the process steps and guidelines required when converting paper records to legally admissible electronic records was introduced as far back as 1996 (!) and has been updated numerous times to keep the standard relevant to consider technological developments. The advantages of an electronic filing system should be obvious. And you really shouldn’t worry too much about this part of your company’s digitalisation. The oldest user amongst our customers is over 80 years old! The truth is, there’s not much to change. You can still stamp documents just like you can with paper ones, apply post-it notes, and even black out information. Forget about your multi-layered tray system for storing paper files on your desk. With an Electronic Document Management Solution, you can find and retrieve any of your files immediately. Thanks to full-text search, it doesn’t matter where your document is or what the file name is. All you need to search for it one of the terms that appear somewhere in the document. Search through millions of files and retrieve the one you need in a matter of seconds. Once you implement an electronic filing system for your documents, file storage takes care of itself. You can easily import new files via drag & drop, your office scanner, from emails or even serial interface. Upon importing a file, the DMS analyses its content immediately using full-text recognition and then deals with it following the rules you set up. You can define rules freely as to how, where and for how long the file you want to store files. Let’s say you wish to find a quotation that you received for “Project XY” that your company is currently working on. You will be able to find and retrieve the document not only under “Suppliers,” but also under the Project name, as well as the “Purchasing” category. There is only one file, and it isn’t saved three separate times in three separate folders, thereby avoiding data redundancy. Fed up with constant trips to the filing room? Save paper and go digital! When it comes to UK legal requirements for converting paper files to electronic format, there are guidelines as to the type of records. 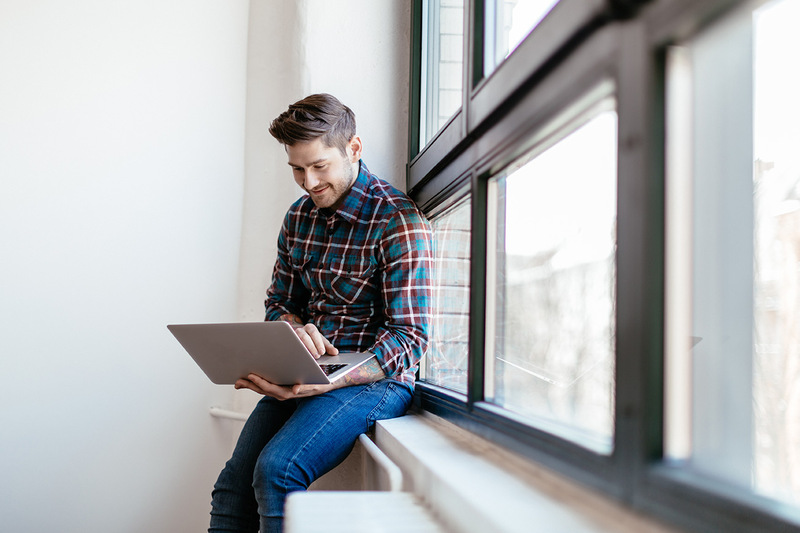 HMRC guidance would apply for general business records which companies must retain for six years for VAT inspection purposes, and they state that as long as your records meet HMRC’s requirements, you can file them digitally. All you need to make sure is that your records are easily accessible in case of a visit from a VAT officer. The Financial Services Authority (FSA) governs IFAs and investment companies and has specific requirements for record keeping, as does the Law Society for Solicitors and Law Firms. For more information about official guidance on digital file retention and storage, please refer to our article on the subject “Digital records and legal admissibility in the UK”. Struggling to move your chair around because you are penned in by filing cabinets? Are their sharp steel edges affecting your Feng Shui Chi energy? Do you suffer from a fit of coughs and sneezes every time you have to go through the archives? There is an alternative! Digitise all your old files. 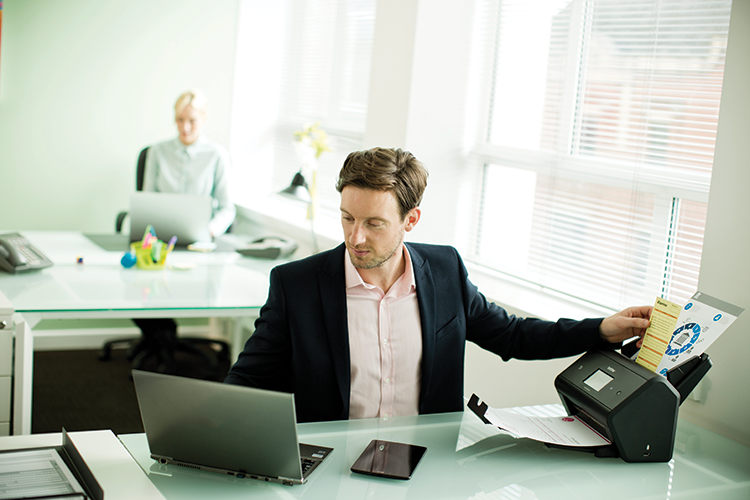 You can either do this yourself with a document scanner or outsource the scanning service to one of the many companies on the market. Your entire file archive will then be completely searchable. You’ll be able to find all of your old documents, reports, and dossiers in seconds. 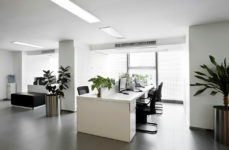 And most importantly of all, you will free-up much-needed office space by getting rid of all that clutter! 5. Your files are always available, even when the employees responsible for them may not be. One big advantage of an Electronic Document Management System is that if one of your employees is sick or on annual leave, the files that they are working on are easily and immediately available. Have you ever had to desperately search through files on someone else’s desk, or try to contact a colleague while they are in a different time zone just to locate an important document? The benefits of a DMS make all of this a thing of the past. The workflow processes that they are responsible for can also be taken care of notwithstanding their absence. Simply name another user as their substitute, and let the rest of the process continue unaffected! Have you ever started working on a document only then to find out that it wasn’t the latest version? In the chaotic world of paper files, file sharing, and email attachment this is often a challenge because of the lack of version control. The benefit of using Document Management software is that the most recent version of a document is always right there. 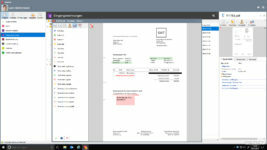 You can compare and restore previous versions easily, as well as track changes by date and user, in addition to seeing which user is currently working on a specific document. As everyone works on the same files within the DMS, all of the problems associated with multiple copies of the same files disappear, as does the need to constantly send emails with the “updated” version of a file as an attachment. Do you sometimes jot down comments on documents, highlight important information or stick Post-its® on adding a quick note for your colleagues? You can still do all of this with an Electronic Document Management System thanks to built-in collaborative working. You can also black out, redact and delete parts of the text with ease. The advantage of a DMS is that if you make a mistake while scribbling or no longer need the note, you can just as easily remove your comments at any time. You can also choose whether your annotations and other additions should still be present in the document, or be removed, in the event you must forward documents on or share them externally. It might seem insignificant, but every time you or your employees stop what you are doing to search for, or file a document away, you are wasting both valuable time and money. Now multiply that by the number of times this happens every day, and then multiply that by the number of employees! Work smarter, not harder. Let a DMS take care of the monotonous admin tasks and get back to enjoying what you do, and creating value for your business. 9. No need to keep your tax consultant waiting for the files they need. You can export automated reports and data at any time, and quickly provide your tax advisor or internal financial controller, or audit office with the information they need immediately. You can even set them up with a direct access so that they can log-in and get the data they need at their leisure. Have you ever stopped to question whether you actually need to install, operate and maintain your own network infrastructure? Take advantage of the benefits of Digital Document Storage hosted in a reliable, secure and certified data centre right here in Germany, thereby increasing your general data security and at the same time reducing your I.T. costs, without affecting your access to your files, wherever you are. As long as they have the relevant rights, users can access documents whether on desktop or mobile and from each different company office locations. 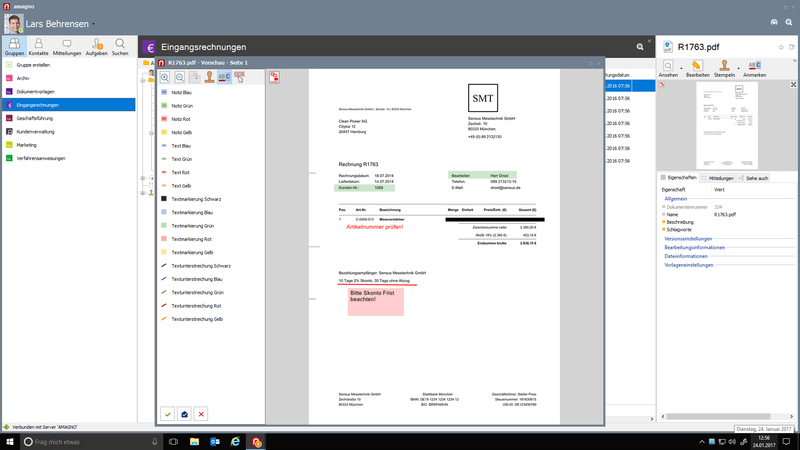 Gone are the days of physically distributing paper invoices to other departments or posting them to other locations. Even when they are on the road, an employee responsible for a particular stage in the workflow process can use a tablet or smartphone to check their tasks and verify or approve documents with a digital stamp. All data is encrypted and transmitted in real time.